My favorite knitting themed children’s book is The Mitten Tree by Candace Christiansen. I found my copy many years ago when browsing the children’s section of my local Barnes & Noble. I was looking for a special book to read to the children in the school where I worked and when I found this book, I immediately identified with the woman who knits throughout the story. I’ve read this story to many children and I’ve always believed that when I had more free time, I would knit mittens for children. Well this holiday season, I knit my first pair and a hat to match. 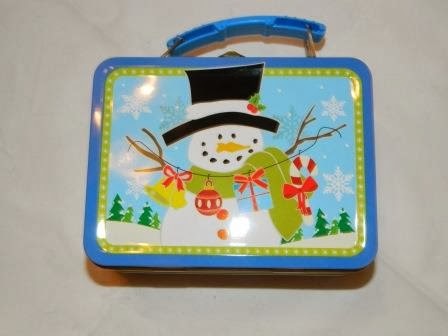 Then I found this cute little snowman lunch box that measures 5 inches by 4 inches by 3 inches deep. 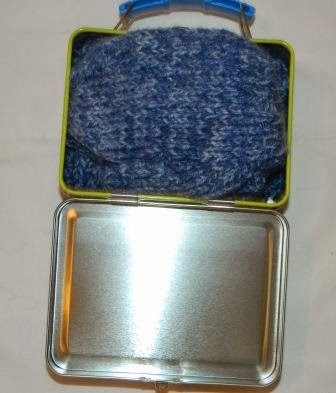 The hat and mittens fit perfectly in the lunch box. So tomorrow, I’m sending this hat and mittens out into the world. I still work in a school and I’m relying on the school secretary to find the ideal recipient for this set. This feel good. I’m finally putting the inspiration from one of my favorite stories into motion. 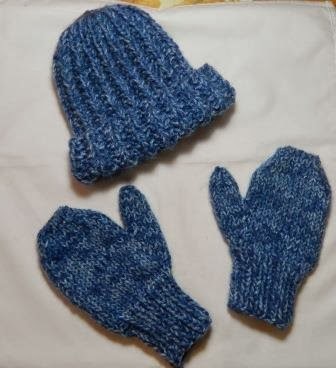 I may not knit as many sets as the woman in the story but I did finish one set!